Linux has many small tools that allow music enthusiasts to practice reading musical notation. Nootka , by developer Tomasz Bojczuk, offers an extensive program that helps guitarists learn notation (Figure 1). Figure 1: With a variety of exercises, playful interactions, and motivating evaluations, Nootka helps guitarists learn classical notation. The program, which runs on many platforms (see the "Installation" box), trains basic musical knowledge and the ear. The software can only display and play whole notes and is thus not suitable as a tool for composing music. Nootka does not allow for odd metrics, rhythms, and subtleties such as triplets, nor does it support chords. Instead, it helps you concentrate fully on learning the difficult art of recognizing notes in classical notation. Nootka relies on Qt5 and is available on many platforms, including Linux, Windows, BSD, and Mac OS. Also, you can install a Nootka version for Android via an APK, which you can find on the website and in the Google Play store. The package managers of common Linux distributions offer the software, and the current stable version is available as a DEB, RPM, and archive for Arch Linux. If you don't want to use the package manager, you can download an AppImage of the current stable version from the website. Although it started under Ubuntu Studio 16.04 without any problems, it didn't run as stably as the other packages. Crashes occurred when changing settings for the user interface and audio port. To build a current version from source, you not only need build tools like Make and GCC, but also the latest development packages for Qt5 and Cmake. Under Ubuntu 16.04, the three-phrase cmake, make, and make install ran without problems for the current development version used in the test (1.4.4.4). The application is integrated into the JACK professional sound system, which makes it easy to connect musical instruments to the program. Some tasks require you to play or sing notes displayed in musical notation, which is something JACK does easily. If you select singing mode, it is also possible to practice with a keyboard, for example, by connecting a software synthesizer like Yoshimi or Calf to the Nootka JACK port. Nootka covers the whole range of classical European music, as well as rock and pop, although the restriction to simple keys in major and minor might become boring in the long run. Additionally, the software lets you analyze and practice ecclesiastical modes, 12-tone compositions, and other special scales (i.e., scales containing notes whose combined use in chords and melodies creates a matching harmonic effect) by freely entering the notes instead of the defaults. Localization of the program shows a love of detail: You can adjust the conventions for naming notes to various international languages, which the program then takes into account (Figure 2), and translates the user interface to an acceptable quality, although grammatical errors sometimes slip through. Figure 2: In the basic settings, you can decide whether Nootka should use AHC notation (e.g., as in Germany) or the ABC standard. The Italian DoReMi nomenclature also can be configured. The program teaches notation for all notes used in equal temperament  and pure intonation  tuning, although Nootka is mainly geared to standard guitar tuning. If you use a software synthesizer such as Yoshimi, you can use pure intonation, with the correct distinction between tones such as E-sharp and F, and learn and practice the correct notation for such tunings. In single-note mode, you can display enharmonic equivalents , wherein some notes have different names on different scales, although they sound the same in temperament tuning (as is customary with piano and guitar). Thus C-sharp on the guitar is identical to B, but can actually be played with a different frequency on a violin. The supposedly simple concept of Nootka thus turns out to be a simple training system for solid basic knowledge, which can be used for very demanding compositions (Figure 3). Figure 3: Nootka can display simple notation with letters along with standard notation, if desired. 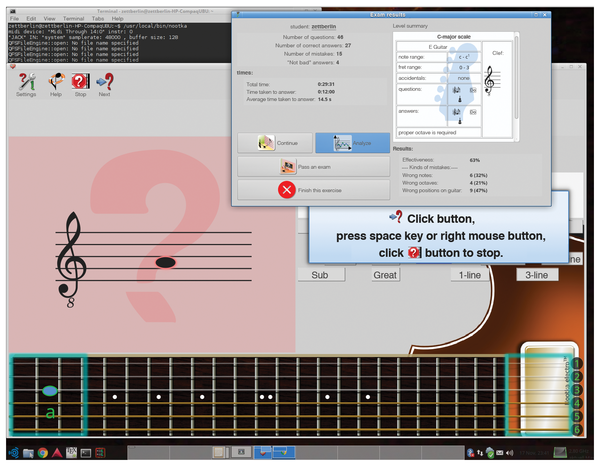 If you don't have any experience with notation, you should first use a function that is not necessarily obvious in the basic view of the program: Nootka displays detailed information about the notes played on a connected instrument, which allows beginners to explore the connections between notes played on a guitar and notation in free mode. The program recognizes each tone with remarkable accuracy and displays it as a note. The tutorials provided are all based on the assumption that you know the position of the notes in sheet music; it is all about training precision and speed, rather than learning the basics. Depending on your previous knowledge, you can reconfigure the tutorials as required (see the box titled "A Question of Settings"). The overall appearance and behavior of Nootka largely depends on the settings for the selected level and those in Appearance. For example, in a level that is set to single note, the software only displays one note in the stave, with the exact name in the box to the right. Levels set to Melody present long lines with multiple notes, all of which are whole notes, but can assume pitches available in classical notation. You can hide many elements of the interface to make room for others that expand accordingly. 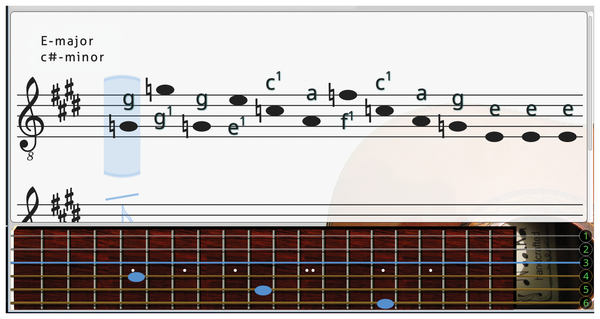 The sheet music and – in single note mode – the table of notes remain visible. In the level editor, you can select or complete training tasks of different difficulty levels and thematic focus. In this way, you can decide whether a tutorial should contain exercises for single notes only or for melodies. The software explicitly points out contradictory selections and does not offer an automatic mechanism to resolve conflicts, which means you have to resolve the problems yourself. Although easy levels are available from the beginning to test your knowledge, beginners should first choose exercise rather than exam. Such tutorials do not set a time limit and simply ask one question after another on one subject. You can disable the somewhat inconvenient way of asking the next question and confirming the answer in the toolbar by pressing the Spacebar and Enter keys instead. 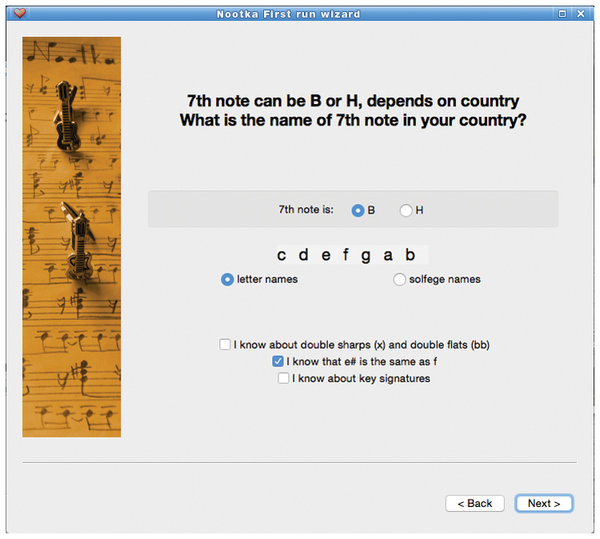 After a short delay, the program automatically asks new questions and accepts the inserted or played note as the answer. You can quit an exercise at any time by pressing the Stop button in the upper left corner. Clicking on Analyze shows an overview of the quality of answers given and the time required (Figure 4). 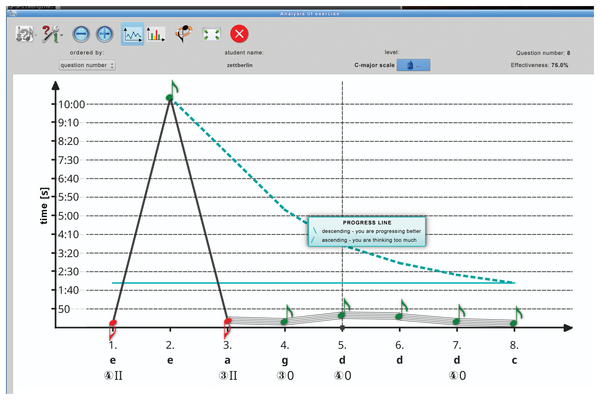 Figure 4: The analysis shows hints about the meaning of the curves when you mouse over an element. During exercises, an automatic function proposes to test the same topic with tougher specifications when the answers reach a certain quality (Figure 5). If you answer most of the questions relatively quickly during testing, you will be shown a cute little certificate. 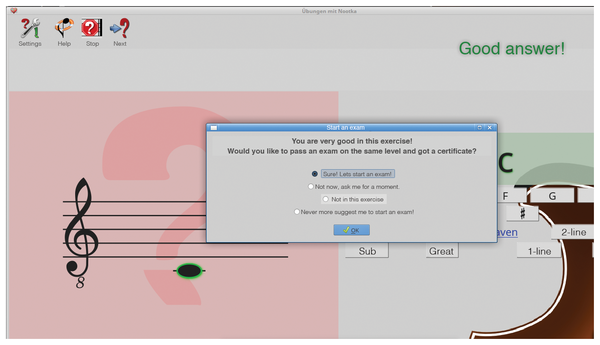 Figure 5: When your performance reaches a certain level in exercises, Nootka offers to administer an exam. If Nootka doesn't quite meet your requirements, other projects offer additional possibilities. For example, the Java program ScoreDate  offers considerably less customization, but also allows rhythm training, including drum notes. Additionally, it does not limit its musical notation to whole notes. The last update of the program was in 2012, but the package from Ubuntu "Universe" works fine. Impro-Visor , which is not necessarily suitable for beginners, is aimed primarily at ambitious jazz musicians, offering a wide range of practice possibilities. The program allows you to compile virtual backing bands for your own improvisations and comes with more than 400MB of musical material on board. Music examples by well-known jazz legends such as Dizzy Gillespie and Charlie Parker let you analyze the stylistic compositional methods of the genre. Contrary to what might be expected from the outdated website, the developers regularly maintain Impro-Visor. The current version is from June 2017. Solfege helps you advance your musical knowledge and lets you practice identifying intervals, scales, and chords. Even admins get bitten by the gaming bug. Frets on Fire lets you train for an air guitar competition. Or try the free business simulation clones Transport Tycoon, Simutrans, or OpenTTD.